Raja was a beautiful young colt and his owners had high expectations for him. A Thoroughbred of noble bloodlines, the hopes were that he would one day compete, and maybe even win, the Kentucky Derby. But when Raja was still a foal, a thunderstorm came roaring through his pasture and a bolt of lightning struck, and killed, his mother. That one event, and Raja's resultant fear of lightning, would shape his life for years to come. Raja soon grows into a strong and fast horse. He, and a few of his pasture-mates, are sent off for training and it looks like Raja will truly become a famous racehorse. He wins race after race and is headed for the Kentucky Derby, but then a freak starting gate accident, caused by Raja's reaction to a bolt of lightning, ends his racing career. His racing career behind him, Raja is sold and winds up in the capable hands of Michelle, a show trainer with a knack for understanding horses. She loves Raja's beauty and large size, as well as his powerful hind end. Michelle believes that Raja would make an awesome jumping horse and her assumption is soon proven true. Raja blossoms under Michelle's care, but their relationship is cut short, and the horse finds himself being sold again. From Michelle's farm, Raja is bounced around between various owners, occupations, and locations. His fear of lightning comes into play several times, so that just when things seem to be going well, a fierce storm comes rolling through and the beautiful horse's natural instincts take over, each time with unpleasant results. Will Raja ever find a "forever home?" Like most young adult horse books, the human characters talk to each other throughout the story. However, Rajaadds another dimension because the narrator is actually the horse. We see events from the horse's point of view, with various equine characters talking to each other. Rather than simply see the fear or confusion in Raja's eyes, the reader is given an insider's look into what the horse may actually be thinking. We read what Raja is thinking as a storm approaches, and how he feels as he is sent through an auction. 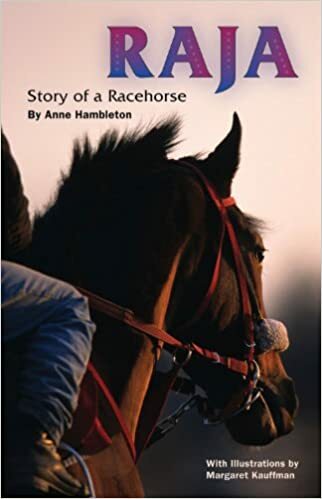 Horse action is authentic and it's obvious that the author has an extensive background with horses. Races, jumping scenes, and the horrors of horse auctions, are all realistically portrayed. Anyone, young adult or adult, who loves a good animal story, should check out Raja. Quill says: Horse fans will be rooting for Raja, hoping that the talented horse is finally given the chance he deserves to rise to the top.